Welcome and thank you for visiting our research group’s web page. 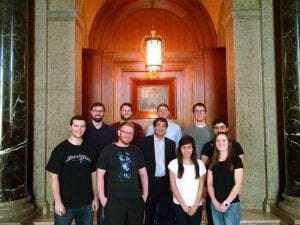 We are an Analytical Chemistry group conducting biomedical and environmental “X-omics” research at Baylor University. Our research activities include exploration in various areas of modern mass and ion mobility spectrometry, spectroscopy, ion-molecule reaction kinetics, bioinformatics, and biomarker discovery for early detection of human illnesses such as cancer. A major portion of our research activities focuses on development of state-of-the-art instruments and multidimensional data analysis approaches for comprehensive characterization of complex mixtures. Please use the top menus to learn about our research, our team members, and our lab/instrumental capabilities. Enjoy your vist! Congratulations to Solouki Group member Christina Gaw for receiving a Barry Goldwater Scholarship! This scholarship is one of the oldest and most prestigious national awards for undergraduate researchers in mathematics, the natural sciences, and engineering. Christina’s undergraduate research is focused on coupling GC to vacuum ultraviolet spectroscopy and mass spectrometry (GC/VUV-MS) for “fingerprinting” complex sample mixtures, metabolomics studies, and analysis of small volatile molecules. Congratulations to Solouki Group member Ian Anthony for winning the Annual Graduate Research Showcase in the STEM category this year! Other deserving and contributing group members in the research showcased include: Mathew Brantley, Christina Gaw, and Adam Floyd. Congratulations to Solouki Group member Michael E. Pettit for his successful application to the National Research Council’s Research Associateship Program. Through a national competition, Michael’s proposal was recommended for funding by the Fellowships Office of the National Academies of Sciences, Engineering, and Medicine. As a result, Michael has been offered a position as an NRC Research Associate and was awarded a Postdoctoral Fellowship from the National Institute of Standards and Technology (NIST). Congratulations to Solouki Group member Carter Lantz for receiving “Undergraduate Poster Award” at the 65th American Society for Mass Spectrometry Conference in Indianapolis, IN (a national/international competition). Carter has just started his graduate studies at the University of California in LA (UCLA). Congratulations to Solouki Group member Ian Anthony for winning the first place prize for presentation of his research at the 2016 Baylor University Three-Minute Thesis competition! Congratulations to Solouki Group member Michael E. Pettit for being re-elected as President of the Chemistry Graduate Student Association (CGSA)! Congratulations to former Solouki Group member Elizabeth Neumann, whose research was just highlighted by the National Science Foundation! Check out the video here to see what Elizabeth is up to. Congratulations to Solouki group member Dr. Brett D. Harper for successfully defending his dissertation, “Structural Analysis of Biomolecules Using Ion Mobility and Mass Spectrometry: Exploration of Ion Rearrangements and Conformations”, to earn his PhD in Biomedical Studies! Congratulations to Solouki Group member Brett Harper for winning the first place poster prize at the Royal Society of Chemistry (RSC)-Pan Africa Chemistry Network (PACN) conference in Nairobi, Kenya for his research on ion mobility-mass spectrometry (IM-MS) analysis of human saliva and development of a rapid MS technique to ensure pharmaceutical integrity in resource limited settings! Congratulations to Solouki Group member Dr. Abayomi Daniel Olaitan for earning his PhD in Chemistry after the successful defense of his dissertation titled: “Improved Mass Spectrometry Characterization of Organic Compounds Using Analyte Preconcentration and Radio-Frequency Ionization”! Congratulations to Solouki group member Dr. Mahsan Miladi for successfully defending her dissertation, “Structural Characterization of Peptides and Peptide Fragment Ions Using High Resolution Mass Spectrometry and Ion Mobility Spectrometry”, to earn her PhD in Chemistry! 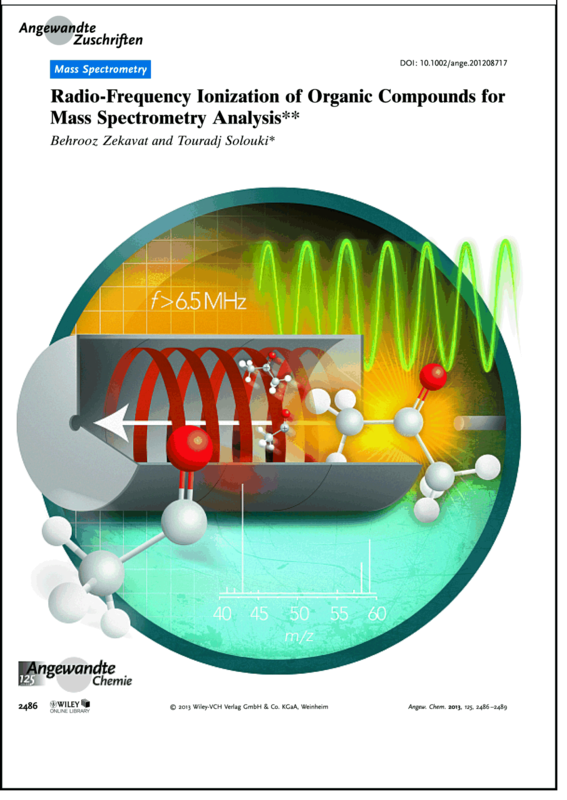 Congratulations to postdoctoral scholar Dr. Behrooz Zekavat, whose work on the co-discovery of radio-frequency ionization (RFI) was featured on the cover of Angewandte Chemie International Edition!